What do you mean by a Persuasive essay? 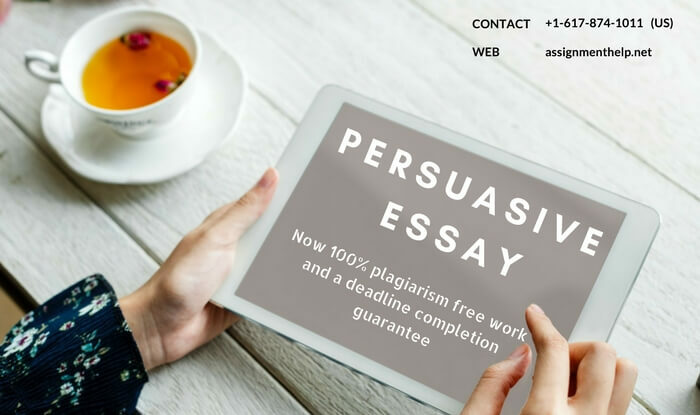 Persuasive essay is a type of essay writing in which the essay writer is trying to persuade the reader about the topic or something related with it. The essay writer takes a stand about something, expresses his or her opinions on the subject an then directs the readers minds towards certain direction , which can be in favor of or in against . The persuasive essay writer’s main goal is to convince the readers, being trustful making them trust you with your words. It is actually making the reader accept a particular point of view. This types of essay re helpful in raising awareness and building a solid core understanding for the readers. Proving your point is correct and the opposing view action is incorrect is the main point of a persuasive essay. Persuasive essays are versatile and universal which are found everywhere. They are found extensively in the newspapers, blog writings, articles, political speeches and even in the advertisings. The main purpose is not to inform but stat and convince a particular point in this essay type. Persuasive essay writing always perks up much doubts and confusion as it is similar with other essays write up. For clearing these doubts and queries, contact us for the persuasive essay assignment help desk. We provide tutor who are highly professionals and high and prestigious degree holders. Contact u on our helpline number which is 24*7 available. This means writing a prewrite-up before framing the main persuasive essay. This phase is very important as it peach out the main ideas, main conflicts, the motive and the importance of it. The writers should plan each and every aspect of the persuasive essay in it. The first thing that they should do is to read and understand the topic thoroughly. This further helps in making your points clear. But before that, you have to choose a side. That side will be side which you are going to advocate and the other side will be the one you will be opposing. That position of yours is very important. Secondly, understand your audience well. Research about them and make things clear at the very start. The reader’s perspective should be kept in check and should not be disrespected. If the reader is on an undeciding turf, make things clear firstly then proceed with the topic intact. Research work is one of the main cornerstones of this type of essay writing. The essay is a sack full of information and reasoning. For this, a solid and very convincing research work is required. Online materials and libraries are the best help for the research. The last thing is to identify the main points which build the core of your essay. Key points should be stated clear. The next thing is to make a draft of the persuasive essay. The starting paragraph or the introductory paragraph should include a strong hook which will grab the reader’s attention right from the start. A question or a quotation in the start is considered a good start. There should be no room for any doubts or confusion left. The position of the writer should be stated clear and concisely. Every paragraph which is written should emphasize on a different point ad make a good note on them. Leave no stones unturned in defining terms and definitions. In the last paragraph, the paragraph should be ended with an important advice and evidence which will eventually encourage the readers to look into the subject. The third thing that you should do is to revise your persuasive essay after making the draft. This helps in making certain amendments to the essay in the meantime. The writers review, analyze, modify and also their reorganize the essay put up. This helps in making the writing the best of the lot. The writer have to make sure that the relevant facts are publicized well, the positioning of the idea of the essay, the quotations and the required examples. The intro paragraph should be very interesting or else the readers will lose interest immediately. Also, besides putting up the idea well, the writer should also clearly stat the opposing idea and stat its demerits. The paragraph as well as the sentence structuring should be made top notch. The next thing to make sure is to give a good editing to the essay. Proofread and correcting the errors, the errors can be grammatical, punctuation or spelling. They should be corrected on the first hand. The editing work should also be worked upon the mechanics of the essay as well like the clarity in the content and the style of writing, if it’s suitable for the audience or not. Editing can also be done by asking out a friend to read the essay for you and see if any mistakes are there. This would help a lot and save much of the time. The final stage is to publish your work. This is the final and the most difficult one also. Many a times the writers write something but doesn’t publish their work, having a fear of rejection. Publishing the work will only enhance your writing for next time. Share it online on social media platforms or publish it any magazines or simple, share it in your classrooms. Gather an audience. See the experience of them and learn from it. What is the outline for the Persuasive essay? Start off with a hook, which will grab a reader’s attention instantly. The attention of the reader is everything in a write up. Next, stat the argument of the topic in brief to the readers to get a grasp on. Close the introductory paragraph with a thesis statement which will clearly stat the arguementive position. Body paragraphs are main core of an essay. Each and every body paragraph which is there must focus on only one individual topic. The details and facts must be positioned and stated clearly. In this paragraph, the view which we are opposing is stated and described well. It is described in such that the pointers that it make, will be refuted easily by the readers. This is the last and a very important part of a persuasive essay. In this, the writer should reinstate all his argument and details and also give out the important thesis statement. The conclusion should be strong for giving lasting impression on the readers and changing their minds. Persuasive essay writing is very simple writing with first thought but is actually quite hard to master, and as a result the students get confused and are not able to complete the assignments in time. But from now on, students don’t have to worry. We provide the best work and assure the students good grades in class. We assign a team of tutors, who work hardworking on your projects to give the best service. Our team of tutors provide a 100% plagiarism free work and a deadline completion guarantee. These tutors are friendly and have a penchant for higher understanding of the subject which will help the student in the long run. To know more about the persuasive essay writing services which we provide, contact us or visit our website assignmenthelp.net.